Contact Welsh Water customer services by dialling their freephone number 0800 052 0145 for free to discuss your water bill, to open a new account and to notify them that you are moving home. You can also call this helpline to confirm their usage rates so that you can choose the payment plan that saves you the most money. Moreover you should dial this number to check if your new house falls within their service area so that you can set up your new account as quickly as possible. Furthermore if your household income is below £15000 you can phone their customer care staff to apply for their HelpU scheme whereby you can save money on your monthly water bills. Likewise if you suspect that you have been overcharged on a recent water bill you can phone this helpline to reach their billing enquiries team who can process a refund on your behalf. Lines are open 8am-8pm Monday-Friday and 8:30am-1:30pm Saturday so note that Welsh Water are unable to take general account enquiries on Sundays. As mentioned they operate a freephone service thus you can call their customer service contact number 0800 052 0145 for free from any UK landline or mobile device. Cysylltwch â gwasanaethau cwsmeriaid Dwr Cymru drwy ddeialu eu rhif ffôn 0800 052 6058 i drafod eich bil dŵr, i agor cyfrif newydd a ganslo’ch contract presennol. Ar ben hynny, gallwch ffonio llinell gymorth hon i wirio eu cyfraddau gwasanaeth presennol ac i gael help i dalu eich biliau os ydych yn y cartref incwm isel. Mae’r llinellau ar agor o 8am i 8pm o ddydd Llun i ddydd Gwener ac 8:30am i 1:30pm Dydd Sadwrn, galwadau am ddim o linellau tir a ffonau symudol yn y DU. Phone Welsh Water from outside the UK by calling their international contact number +44 29 2090 7703 to switch off your water supply from abroad, for billing enquiries and to set up a new account if you are moving from an overseas country. Be aware that unlike the UK freephone service these calls will not be free of charge and that the exact rate is dependent on which country you phone from. You should also be aware that calls from mobiles will usually cost considerably more than the equivalent landline call unless you have an appropriate roaming package on your tariff. Contact Welsh Water using a textphone device by dialling their dedicated number 18001 0800 052 0145. This service enables customers who are either hard of hearing or have a speech impediment to direct enquiries about water bills, account and payments to the company. Like the standard telephone number this service is free of charge. Contact Welsh Water on their freephone number 0800 052 0140 to submit a meter reading so that you avoid excess estimated charges on your bill. You should also dial this number to report a faulty water meter which is reporting incorrect usage so that an engineer can come out and fix the issue. If Welsh Water are planning on changing the rates they charge for usage you can also call this helpline to switch to a direct debit payment structure. Contact Welsh Water to make a payment towards your bill by calling their automated freephone billing number 0800 028 5209 for free. Here you can also check your current balance, get an estimated bill for your next payment period and to confirm their usage rates. This service is available 24 hours a day, seven days a week to give you flexibility when making a bill payment. Call Welsh Water on their freephone contact number 0800 281 141 to confirm the identification card details of an engineer or door salesman purporting to be from the company. Their staff are trained to wait patiently whilst you check so please do not feel pressured into letting someone in if you suspect they may not be a legitimate staff member. If the individual is not a genuine Welsh Water employee they will then ask for a description so that they can be reported to the police. Contact Welsh Water on their UK freephone number 0800 052 0145 for surface water drainage enquiries, thus you can call this helpline to report a fault in their drainage system causing an overflow onto your property. Moreover you can phone this number to apply for a rebate on your surface water drainage bill if you can prove that no rainwater that falls on your property enters the public sewer system. Contact Welsh Water for free on their emergency phone number 0800 052 0130< to report flooding or a burst pipe on your property. By contrast you can also call this helpline if you are not receiving any water at your house, meaning that your taps and hot water are not working. Moreover if your drinking water is discoloured or has a chemical smell you should phone this number immediately to report the problem to their quality control team. Alternatively if you wish to report a water leak affecting one of Welsh Water’s public pipes such as a burst main or for sewerage emergencies you can consult the table below to find the correct phone number for you to call. Contact Welsh Water on their dedicated developer services phone number 0800 917 2652 for free to discuss adding a new connection for newly-built properties, for planning guidance when extending your home and to pay your quote once they have connected sewerage pipes to your new site. If you regularly build new houses in the Welsh Water catchment area you can phone this helpline to set up an account with them which speeds up the process of applying for permission to connect to their main water and sewerage pipes. Phone Welsh Water Wholesale on their freephone enquiries number 0800 260 5053 to contact an advisor about your business water and drainage needs. For example you can phone this number to notify them that you are expanding your operations and therefore you would like to switch to a commercial account which has lower usage rates. Furthermore you should phone this number to notify them that your business is moving premises or has recently changed ownership so that they can update your account accordingly. Welsh Water offer a number of email addresses and office locations for customers who would prefer to discuss their general enquiries in writing, furthermore you can even contact them via their social media profiles which are listed below for your convenience. 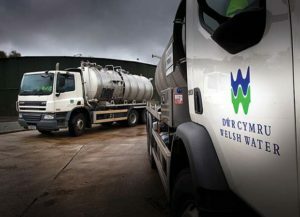 Customers looking to email Welsh Water about their bills, accounts, sewerage draining and new connections may select the appropriate address from the following list, they endeavour to respond within 10 working days of receiving the message so it is recommended that you call them instead for any urgent enquiries. Welsh Water operate a number of postal addresses within the Cardiff area where you can send letters regarding your bills, water pipes and where developers can enquire about new connections, please be aware that you should not include any sensitive information about your payment details when writing to Welsh Water as this is not a secure way to communicate. Billing Customer Services, Dŵr Cymru Welsh Water, PO Box 690, Cardiff, CF3 5WL, United Kingdom. Water Customer Services, Dŵr Cymru Welsh Water, PO Box 3118, Cardiff, CF30 0BY, United Kingdom. Developer Services, Dŵr Cymru Welsh Water, PO Box 3146, Cardiff, CF30 0EH, United Kingdom. Welsh Water have a selection of profiles on some of the more popular social media networks as a way to promote their network, to make announcements about water emergencies and for their customers to write public messages about problems with their bills.